It has been some time since Creative has updated its Sound Blaster line of sound card. And if external sound cards ain't your thing, check out the all new Sound Blaster X-Fi Titanium HD! 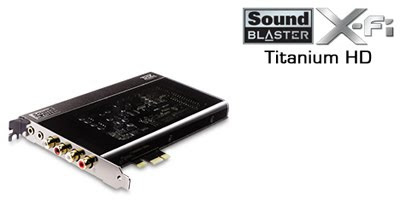 Touted as the sound card that provides the "highest quality audio playback of any other sound card Creative has ever introduced", the Titanium HD offers you the ultimate Sound Blaster experience! Made with high quality components and featuring an amazing 115dB, 24-bit/96kHz support in HD quality sound for original playback, the Titanium HD also comes equipped with the THX TruStudio PC software. Before you shell your precious moolah for this card, do note that it only supports Windows Vista and 7.